The American Numismatic Society. Catalogue of the International Exhibition of Contemporary Medals. March 1910. New and revised edition. New York. 1911. xxxvi, 412 pages, 512 illustrations. $3.00. THE INTELLIGENCER PRINTING CO. LANCASTER, PA. The hoard of 875 bronze coins, of varying sizes and weights, which we have here to describe, was found on September 1st, 1931, at a level within the Roman fort of Richborough, which has been dated to the same age as the walls. These were probably erected within the years A. D. 275 and 296. The evidence of the finder is to the effect that the coins, though found in a mass, were unaccompanied by any trace of purse, box or other container and showed no sign of having been secreted in a hole in a wall or in thatch. 1 The corrosion of some of the coins and traces of wood-fibre (?) on them suggest possible burial in a box with iron bands. The site on which the coins were found seems to have carried a hut, with a foundation course to its walls of large rough pieces of Folkstone stone. The coins lay near an angle of this foundation, as they might if buried under a hearth. The general level of the site has yielded pottery of late third to fourth century date. Imitations of Known Radiate Types. There remain 312 coins, which were either illegible or, at least, seemed to add nothing to those here described, making up a grand total of 875. The coins, when found, were on the whole in very fair condition. They were mainly loose, but, in a few cases, were stuck together in two's and three's. The incrustation varied from a soft, earthy covering to a hard nodular oxide of iron, either in patches or covering the whole surface. In some cases both faces of the coin had been corroded; in others, there were suggestions of possible burning by fire. All, without exception, were struck, not cast. The flans vary in thickness from paper-like flakes to an average 'radiate' size; they are often irregular in shape and occasionally have one or more projecting knobs of metal on the edge. Extensive clipping has in a few cases produced something like a triangular shape. The die is sometimes correctly adjusted to the flan, sometimes it fails to find room on it. Apart from this occasional failure of adjustment, the striking was fairly well done. In some cases there is a border of dots, that may degenerate into various arrangements of strokes, in others, no border at all. The coins vary in size from .35 to .85 inches (9 to 22 mm); in weight, from 4.8 gr. to 69.5 gr. (.31-4.5 gm). An interesting feature of the hoard is the occurrence of die-identities, either on both sides or one only. The same obverse and reverse dies occur on Nos. 104 and 105; 265 and 266; 281, 282 and 292; 307 and 308; 407 and 412; 413 and 414A; 477, 508 and 509; 478 and 479: the same obverse dies occur on Nos. 414 and 414A; the same reverse dies on Nos. 178 and 179; Nos. 307, 308 and 309; 537 and 538. These identities are not numerous enough to suggest that our mass of coinage had come direct from a single mint; they are sufficiently numerous to convince us that we are not dealing with a chance mass of coin adrift on the market. We shall consider later what this may mean. The great majority of the coins bear neither name of Emperor nor features to identify one; but notinfrequent exceptions occur and we are reminded at one point or another, by legend or portrait, of Gallienus, (Nos. 163, 172), Claudius II, (Nos. 23 ff, 166, 184, 346), Quintillus (Nos. 160, 316, 453), Tacitus, (Nos. 206, 359), Probus, (Nos. 245, 465, 492, 522, 550), Postumus, (Nos. 69, 298, 350, 396, 406, 553), Victorinus, (Nos. 187, 237, 357, 360), Carausius, (No. 451). Far commonest are the suggestions of Tetricus I (Nos. 51, 53, 85, 114, 293, 412, 430, 461, etc.) and of Tetricus II, with youthful features, (Nos. 77, 102, 163, 312, 401, 421, etc.). Examples of head to left occur, but they are even rarer than in the original series. The range of the imitation, then, is over the period of extreme debasement, from circa A. D. 258 to 274 and, less intensively, over the radiates of the reform of Aurelian, circa A. D. 274-296. There is more diversity, then, in the obverses than is usual in hoards of 'barbarous radiates.' In some cases, there is something in- definably alien in the look of the head; hardly anything but the radiation reminds us of a Roman coin. The reverse types are, in some cases, copied with considerable fidelity from 3rd century models; but, even where the original type is preserved, the legend is seldom clear. Exceptions that prove the rule may be seen in Consecratio (Nos. 24 ff), Hilaritas (No. 62), PAX (Nos. 99, 119, 195), SPES (Nos. 181, 198), VIRTUS (No. 173). A remarkable feature of the reverse types is that many of them produce variations on the standing figures of their 3rd century originals, so marked as to appear deliberate rather than accidental or careless. Occasionally, the direction of the original type is reversed, as, for example, Sol Invictus to right, instead of to left (Nos. 83 ff). In so far as the reverses copy definite originals, the divergence from the normal may be studied under our careful classification, assisted by the Plates. 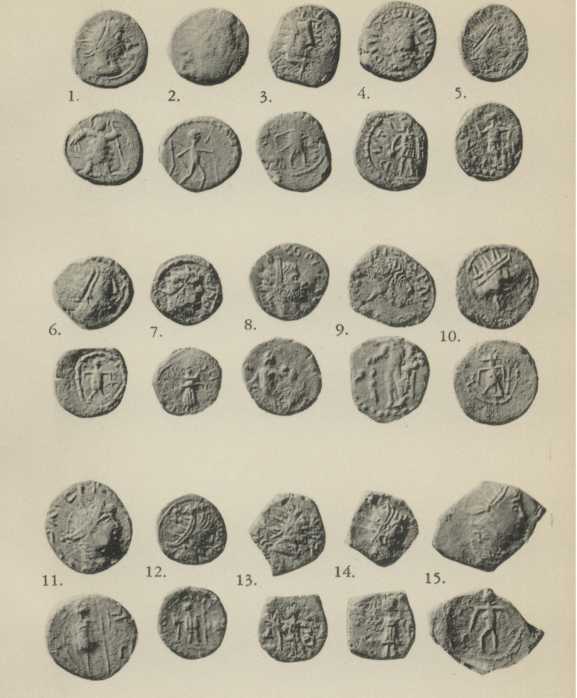 The large class of coins not to be associated with specific originals has been arranged in formal groups, 'standing front' 'right' or 'left' 'figures undraped' or 'draped.' It may ultimately be possible, with the aid of further hoards, to trace the original of many types at present mysterious. That there should be mistakes in our descriptions of obscure and hitherto unknown types is inevitable. May the scholar of the future who corrects such errors judge us not too unkindly! The most notable feature of our hoard remains still to be mentioned. It includes (1) a series of coins (Nos. 528-546) showing knowledge of originals of the fourth century,—c. A. D. 348-361 and c. A. D. 364-375; (2) another series (Nos. 547-563) showing types, often with more than one figure, of so original a character that they cannot be traced to any Roman model of the third century or later. Both series, though relatively small in the bulk of the hoard, contain a sufficient number of coins to assure us that it is no case of mere accident. Of series (1) we shall have to speak more fully later. Of series (2) we may say at once that it supplies full evidence that the makers of our coins were not copyists only, —that they actually had new ideas of their own, which they tried, with varying success, to express in the language of reverse types. Some of the twofigure types seem to aim at expressing scenes of combat or, possibly, in some cases, of ritual, which, however obscure to us, yet speak a language of their own. Of the other types of the group, some may well be derived ultimately from radiate models. The 'Cross with pellets,' for example, might arise either from the 'Altar' of Divus Claudius or from a completely formalized and degraded standing figure, such as Spes. But, in such cases, even if imitation be present, it has reached the point of new creation; the Roman types only serve as raw material for new. We are now in a position to attack the problems that constitute the main interest of our hoard—the date at which it was buried and the conditions at Rutupiae which its burial would seem to imply. Our knowledge is still imperfect, a mere ray of light in the darkness, but, even so, its disclosures are exciting enough. As our hoard belongs, formally, to the large and much discussed class of 'barbarous radiates,' a glance at the history of these curious finds will be of value. The 'barbarous radiates' have long been a battlefield of conflicting creeds. The idea that they might represent in some way or other the coinage of the Dark Age in Britain—the fifth to sixth century A. D.—was natural enough and seems to have been widely held in the early and mid-nineteenth century. 2 M. Adrien Blanchet, in a notable paper, repudiated the idea, as far as it affected Gaul, and declared that imitations of radiate coins, small as well as large, belonged to approximately the same age as the originals. 3 His arguments, based on some evidence of hoards and ably developed, have found general acceptance in France. In our island the fortunes of war have been more varied and successes have been recorded from time to time by both schools—early and late daters. 4 In a paper, written by the late Mrs. Mortimer Wheeler and now published after her death by Mr. O'Neil, 5 we have a description of a hoard of radiate imitations, found in the theatre at St. Albans. The coins are almost all very small, descending to 'minim' 6 size. They vary considerably from their models, and they are almost, if not completely, unmixed with regular radiate coinage. 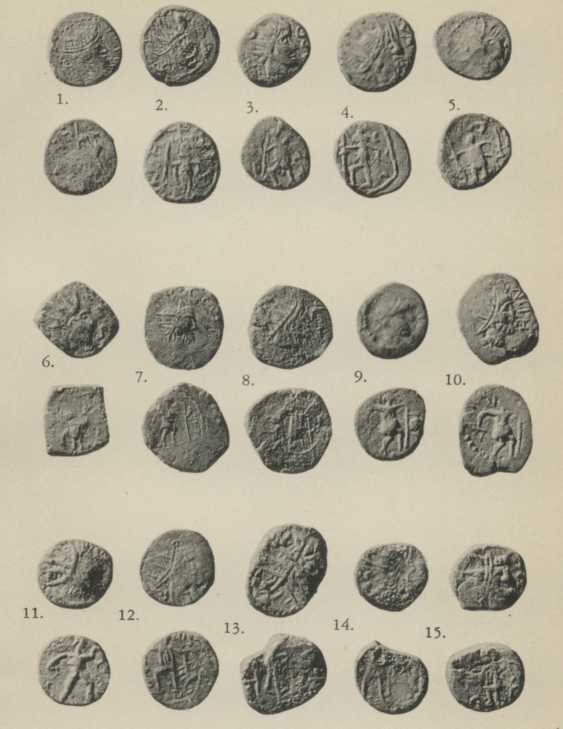 The hoard, then, is one which many numismatists, on general principles, 7 would have wished to place very late. The archaeological evidence, however, is definitely against this view. All competent archaeologists who have tested the evidence agree that the hoard could not have been buried much later than A. D. 300, and, from the numismatic side, it must be admitted that a close examination of details reveals nothing which requires a later date. We must admit, then, an important gain by the 'early' school, most appropriately won by one who was always a gallant fighter on that side. That there is still another view of the case, the present hoard will show. There is no likelihood of an immediate decision— perhaps of any decision—in favour of either extreme view. Radiate coins may have been imitated both early and late. If, in both cases, the imitations were the work of non-Roman, native artists, they might well have a general kinship of kind, which would tend to blur the distinctions of date. For the time being, we must check each hoard on its merits, accumulate evidence and, above all, treasure our exceptions— the points that do not harmonize with our own favourite theories. The Richborough hoard of 1931 is beyond all question late. We leave out of account for the moment the Theodosian copper that was found with or near it. Even if we should end by believing that it was actually part of the hoard, there is at least a possibility that it was not, and the argument will be surer without it. The decisive evidence lies in the radiate coinage itself. Radiate heads, not to be distinguished from the general run of heads in the hoard, are combined in a number of cases with reverses that betray knowledge of fourth century types,—'Fel. Temp. Reparation 'Warrior driving spear at fallen horseman,' Constantius II, etc., c. A. D. 348 and 361, and 'Gloria Romanorum,' 'Emperor dragging captive right,' Valentinian I and colleagues, c. A. D. 364-375. These reverses are, on the whole, quite remarkably like the fourth-century models, and there are no third-century models to which they could, with any reason, alternatively be traced. Here, then, we have the evidence, which has hitherto been lacking, of the 'muling' of radiate obverses with later reverses. 8 The date of the later of the two reverses thus imitated, 'Gloria Romanorum,' takes us down to the very edge of the Theodosian age. This evidence is strong enough to stand by itself. If support were needed, we might point to the unusual freedom with which new types are here created from the limited stock of standing or walking figures in the third-century originals and, particularly, to a range of reverse types, already mentioned, that seems to exceed the bounds of 3rd century possibilities—the 'Cross' type and certain two-figure types in particular. As we have said, the die-cutter seems not so much to have been copying as creating new types. Two-figure types in the third century, except for a short period after Aurelian, were rare in the Western mints; as a matter of fact, they do not seem to have supplied models for our hoard. The earliest possible date, then, for the burial of our hoard is circa A. D. 380-390. But this is only a theoretical possibility. Even without committing ourselves to any general theory of coin-drift, we must obviously allow some time to elapse for an imperial coin to become familiar enough to be imitated in an outlying province. Further, we know from the numerous site-finds of Richborough, that the actual circulation in the fort in the Theodosian age was the small bronze of Theodosius I and his colleagues, and of his predecessors. It is certainly possible that the masses of Theodosian coin did not reach Richborough till nearly the end of the fourth century; it is more than possible—a moral certainty—that they continued to accumulate there well into the fifth century. 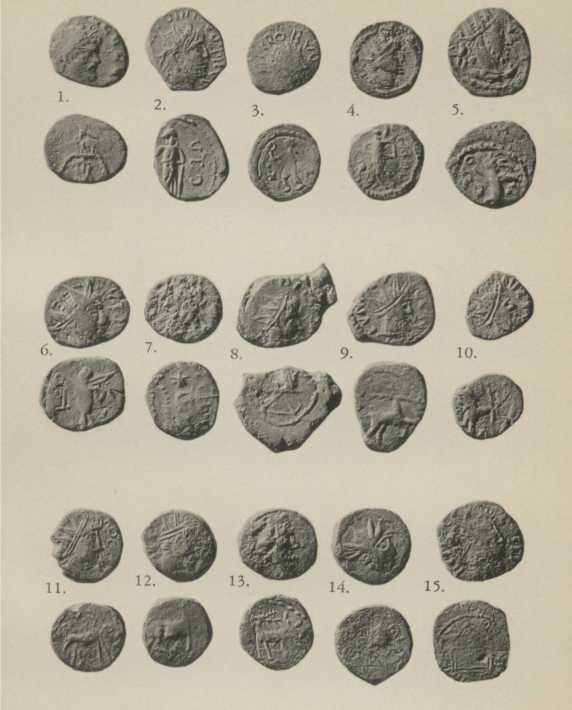 9 There is Ao room, then, at Richborough, for a coinage of the extraordinarily irregular character of our hoard for some long years after the death of Theodosius the Great. (1) Imitations inside the Empire. (2) Issues outside the Empire. These would naturally be made by peoples, bordering on the Empire and familiar with its money, who, needing an increase of supplies and, perhaps, desiring a coinage of their own, are yet compelled to begin with Roman models and betray all manner of misunderstanding both of types and legends. Imitation of models, obsolete or obsolescent in the Empire, would be more properly assigned to this than to the first class. Between classes (1) and (2) would fall issues of communities, which, while loyal in intention, were temporarily or more permanently detached from the Empire. Can we hazard a guess at the reason for the ap- pearance of third-century models—almost to the exclusion of fourth-century models—in this new coinage? Perhaps an observation long since made and developed by C. F. Keary 12 may give us the light we need. He noticed that the silver of Carausius had exercised a remarkably strong influence on the types of sceattas and explained it on the theory that, as comes littoris Saxonici and, afterwards, as Emperor by the grace of Saxons and other rebels, Carausius had circulated his money freely on both sides of the Channel. Developing this line of thought, we may suggest that, for about the last quarter of the third century, including the usurpations of Carausius and Allectus, the Western coasts of the Empire were exposed to Saxon raiders, who, amid the rest of their booty, must have carried off masses of radiate coinage. Constantius Chlorus, when he brought Britain back to the 'eternal light' of Rome, reorganized the coast defences and barred the door against the pirate. For many a long year the Saxon was held at bay. 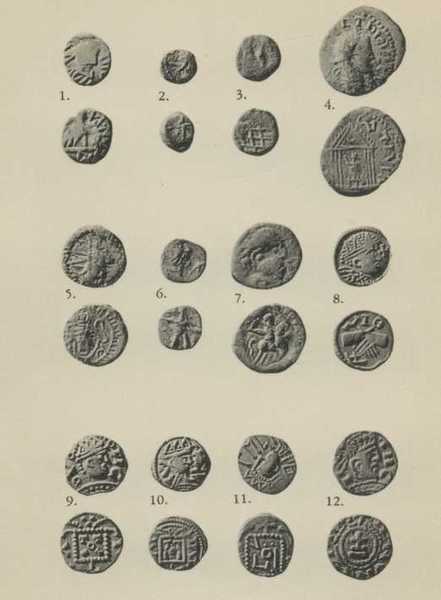 The Saxons, then, might well be familiar with the coinage of the late third century, as they never were with that of the fourth, might continue to use and imitate it in their homes in the Low Countries, and, finally, when they returned to Britain, as settlers not marauders, in the fifth century, might choose to copy it rather than the later Roman models. If this is the case, there should be some evidence of hoards. We cannot at the moment check them satisfactorily. 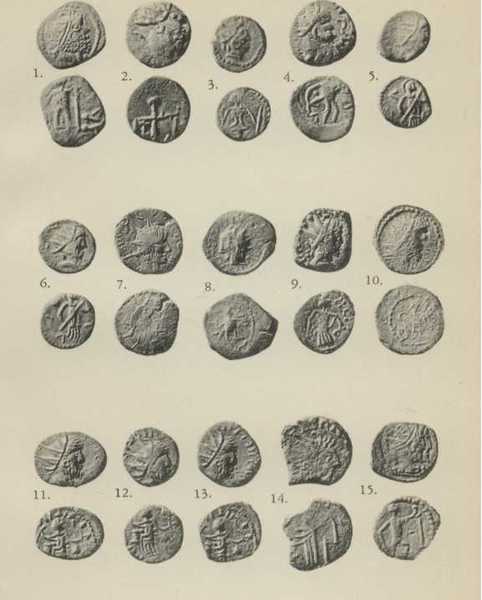 The theory that imitations of radiate coins in the fifth century belong to the Saxons, while imitations of diademed may belong rather to the RomanBritons, might clearly be pushed to absurd extremes. Mr. Sutherland, has already suggested some of the difficulties that might be involved. We can hardly imagine the Roman-Briton saying to himself "I am Roman: diademed for me," while the Saxon retorts "I am Saxon: I prefer radiates." But, we may be very near actual historical truth if we make our theory narrower and more precise and say that the surviving urban communities in Britain of the fifth century clung to Theodosian coinage, and, after that, to imitations of the early fourth-century coinage, but that the recrudescence of radiate imitations was due either to Saxon invaders or to Britons, who abandoned citylife and went 'native' again. Whether the radiate coinage was felt to be pagan, as the diademed was not, is best left undecided for the moment. Of the mint or mints of our coins we know nothing. The occurrence of several die-identities certainly suggest a mint or mints not far remote from the place of finding. Of the value represented by the coins we again know nothing. We might perhaps find in our hoard an 'average' coin, measuring about .7(19 mm) and weighing circa 20 gr. (1.3 gm), and suppose that it represented a standard value. But some few pieces, of greater module and weight, would represent higher values, the 'minims,' presumably, a lower. The art of our hoard, if it may bear that name at all, is of a very humble order, but it is not entirely without shape or character of its own. If it cannot effectively be compared with the nobler products, in gold and enamel, of native British or Jutish artists, it finds frequent parallels in the series of sceattas and of Merovingian silver. This point is developed for us in a short Appendix (II), by Mr. Derek Allen. The bearing of these parallels on the question of date is obvious. They suggest a much longer run, and perhaps a later origin, for our imitations than we should at first have been inclined to assign to them. The authors wish to thank Miss Anne Robertson of Glasgow most warmly for invaluable assistance with the descriptions. A closer description of the 563 classified coins follows. The normal obverse is to be taken as a radiate head to r., without legend; anything beyond this is noted in the 'obverse' column. The reverse descriptions have given us much trouble, as we wished to describe as fully as possible what was to be seen, and yet often could not determine exactly what the die-cutter meant. We have had to resort to frequent marks of interrogation: 'holding? in r. hand,' for example, means 'holding uncertain object.' 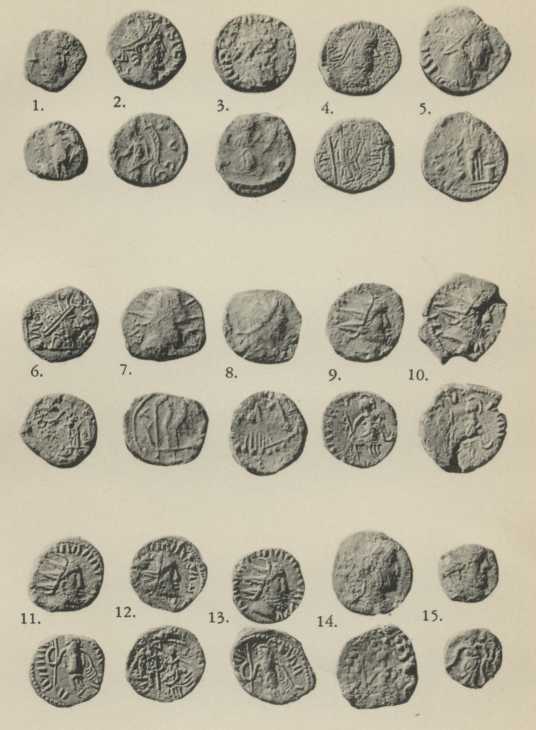 In the case of some coins of special interest and difficulty, drawings are added (cf. p. 108). It is possible that the Bagaudae in Gaul, under Aeliamus and Amandus, A. D. 285-286, struck rude imitations of the Gallic radiates. If coinage of this class really belongs to the Anglo-Saxon and Jutish invaders, it may easily be extensive and of more than one class. On Plate X, Appendix I, we add some examples from the British Museum of what may be late radiate imitations. The Coinages of Western Europe, London, 1879, especially pp. 103 ff. H. Mattingly and W. P. D. Stebbing, Paper to the International Archaeological Congress. Aug. 1932. A late 4th century hoard, found by Mr. Stebbing towards the centre of the fort in 1926, had been thus concealed. From this point on, the arrangement is by reverse types. Cf. Thomas Wright, 'On Anglo-Saxon Antiquities, with a particular reference to the Faussett Collection,' 1854; C. Roach Smith, Arch. Cant. Vol. 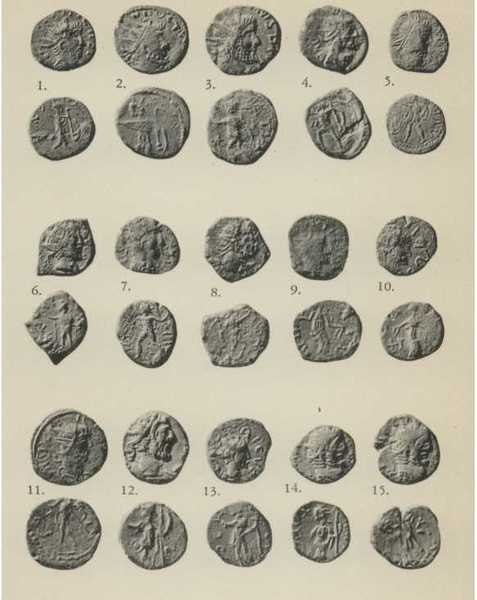 xviii, (1889) p. 72, 'Roman Coins found at Richborough' where he recants his previous belief in a late date for the imitations. 'Les monnaies barbares aux noms et types des deux Tetricus' (Congrèa intern, de Num., Bruxelles, 1910). For the general question, cf. C. H. V. Sutherland in the Num. Chron. (International Numismatic Congress Volume, 1938): the same writer on 'The Hayle Hoard of Radiate Minimi' (Num. Chron. 1936, pp. 202 ff. ), 'The Whitchurch Hoard of Radiate Minimi' (ibid. 1935, pp. 16 ff. ); H. Mattingly, 'Three Hoards of Barbarous Roman Coins,' ibid. 1934, pp. 255 ff. ; R. G. Collingwood 'Archaeology of Roman Britain,' 1930, p. 199. Num. Chron. 1937, pp. 211 ff. A convenient, if vague, description of tiny imitations, very much smaller than any originals. The contemporary imitations naturally would be expected to mix freely with originals. Imitations of radiates and diademed heads are, as a rule, quite distinct in hoards: for possible exceptions, cf. H. Mattingly. Num. Chron. 1934, pp. 255 ff. 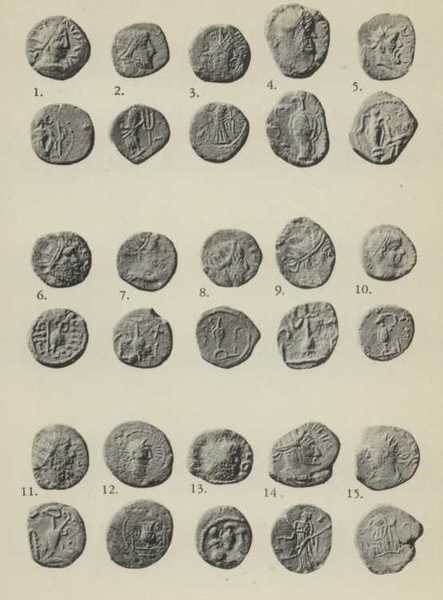 Even when the supplies from Gaul and Italy dried up, what was to prevent the Roman-Britons from extending the life of their Theodosian coinage by skilful, official imitation? There is, as yet, no proof that they did so, but the possibility seems to be worth consideration. Obv. [gall]ienvs [avg] Head radiate r.
Rev. d[ianae] con[s avg] Stag walking l. Mattingly and Sydenham, V i, p. 146, No. 179; Cohen 158. Obv. [imp c postvmvs p f avg] Bust radiate and draped r.
Rev. pax avg Pax standing l. holding branch and vertical sceptre. M. & S., V ii, p. 363, No. 318; Cp. C. 215. Obv. imp c v[ictorinvs p f avg] Bust radiate and draped r.
Rev. prov[identia avg] Providentia standing l. holding baton and cornucopiae; at foot, globe. M. & S., V ii, p. 392, No. 61; C. 101. Obv. [imp vic]torinvs [p f avg] Head or bust radiate r., lower part off flan. Obv. [imp clavdivs avg] Bust radiate r.
Rev. [pax] avg Pax standing l. holding branch and vertical sceptre. M. & S., V i, p. 217, No. 80; C. 201. Obv. imp [c tetricv]s p f avg Bust radiate and draped r.
Rev. hilaritas avgg Hilaritas standing l. holding palm and cornucopiae. M. & S., V ii, p. 408, No. 79; C. 55. Obv. im[p c tetricvs pf avg] Bust radiate and cuirassed r.
Rev. [hilar]itas avgg Hilaritas standing l. holding palm and cornucopiae. Obv. [imp c tet]ricvs p f avg Bust radiate and draped r.
Rev. [laetitia avg] Laetitia standing l., holding wreath and anchor. Small flan. M. & S., V ii, p. 408, Nos. 87ff; C. 7Iff. Obv. imp c tetricvs p f avg Bust radiate and draped r.
Rev. pax avg Pax standing l., holding branch and vertical sceptre. M. & S., 100; C. 95. Obv. imp c tetricvs [p f avg] Bust radiate and draped r.
Rev. [pax] avg Pax standing l., holding branch and vertical sceptre. M. & S., V ii, p. 409, No. 100; C. 95. Obv. [imp c tet]ricvs p f [avg] Bust radiate and draped r.
Rev. [pax av]gg Pax standing l., holding branch and vertical sceptre. Obv. [imp c tet]ricvs p f avg Bust radiate r. Double-struck. Obv. [c piv esv tetri]cvs caes Bust radiate and draped r.
Rev . pa[x avg] Pax standing l., holding branch and sceptre. M. &. S., V ii, p. 422, No. 248; C. 34. Obv. [c] piv tetricvs [p] a[vg] Bust radiate and draped r.
Rev. [pax] avg Pax standing l., holding branch and transverse sceptre. Not in M. & S. or C.
Obv. [c p e] tetricvs [caes] Bust radiate and draped r.
Obv. Legend off flan. Bust radiate and draped r. Rev. Illegible. Obv. [imp] c allectvs p f avg Bust radiate, draped and cuirassed r.
Rev. [fi]des militvm Fides standing l. holding two standards. M. & S., V ii, p. 565, No. 69; C. 8. Obv. const … Bust diademed and draped r. Rev. [fel temp reparatio] Legionary l., spearing fallen horseman. Obv. d n [theodo]sivs p f avg Bust diademed and draped r.
Rev. [salvs reipvblicae] Victory advancing l. dragging captive: ᛡ l. (obliterated) Mint-mark illegible. Obv. [d n theodo]sivs p f avg Bust diademed and draped r.
Rev. [victor]ia av[ggg] Victory advancing l. holding wreath and palm. Mint-mark illegible. Obv. d n arcad[ivs]pf avg Bust diademed and draped r.
Rev. victoria [avggg] Victory advancing l. holding wreath and palm. Mint-mark illegible. Obv. Legend illegible. Bust diademed and draped r.
Rev. [victor]ia avggg. Victory advancing l. holding wreath and palm. Mint-mark illegible. For the relation of Nos. 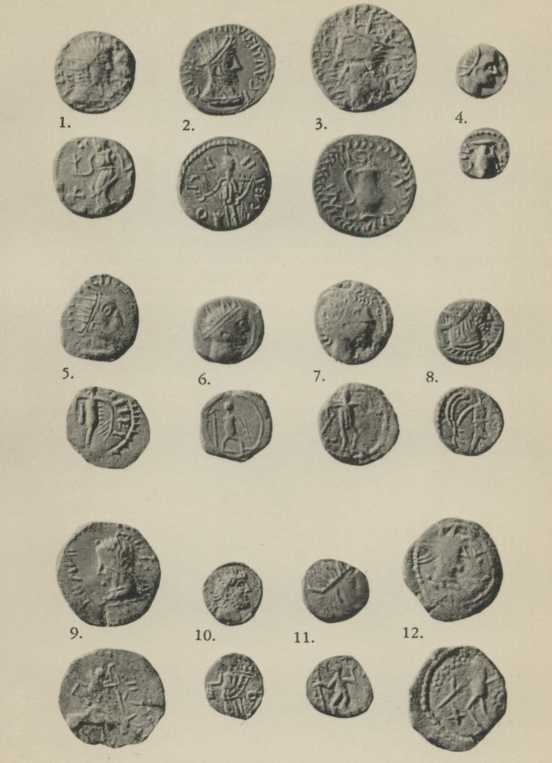 18-22 to this hoard, see p. 10. Prototype: Claudius II. Consecration Issue. 27 .55 21.6 (1.4) No legend. Barbarous small head. Traces of border of dots. M. & S., V ii, p. 234, No. 266; C. 41 ff. Rev. consecratio Eagle with head r. or l.
23 Eagle standing front, head r.
27 Eagle standing front, head l.
M. & S., V i, p. 233, No. 261f; C. 50 ff. 30 Plain altar with double sides and top …. o …. 36 .65 12.8 (.83) Almost smooth. 38 I, 4 .5 21.4 (1.39) Head very barbarous. 39 .5 16.7 (1.08) Bust draped (?). … oΓ vδ …. 40 .55 9.1 (.59) Small bust. 41 .6 20.0 (1.30) Good workmanship. DIV …. DIO. 42 I, 5 .6 24.1 (1.56) Very barbarous. Traces of letters. 43 .55 22.0 (1.42) Traces of letters. 44 I, 6 .55 14.3 (.93) Large head, neck off flan. 33 Altar with flames and panel, containing five pellets. 35 Double-sided altar with five pellets. Doublestruck. 36 Plain altar with panel. Flan thin and spread. 37 Plain altar with four panels cratio. 38 Small plain altar with panel. 39 Small altar with flames, roughly divided into six (?) panels. 40 Altar with flames and crescent in panel. 41 Altar with pellet and circle in panel. Nearly smooth. 42 Altar with lines, extended to end in arrows, and small panel containing pellet. 43 Square altar (? ), containing irregular lines. 44 Lower part of male figure l. (?) To r., high in field, small altar with horizontal lines. Traces of border of dots. 48 I, 9 .55 17.5 (1.13) Line border. 49 .5 21.4 (1.39) Barbarous head, neck ending in straight line. Border of dots. A. Reverse close to prototype. B. Main details preserved, odd style. 55 .5 14.5 (.94) Draped. 46 Altar with incurved sides, from which rise two arrows and between them flames. Pellet in centre. Traces of letters. 48 Altar with incurved sides. Two pellets and stylised flames all around. Border of dots and lines. (cp. Probus: M. & S., V ii, p. 55, No. 355 ff.) holding caduceus and cornucopiae. 49 Felicitas standing front, head l., holding caduceus and cornucopiae. M. & S. (Webb) V ii, p. 407, Nos. 68 ff. ; C. 37 ff. holding two standards. 52 Same type (standard in l. hand, almost off flan). 53 Fides, standing l., holding standard in either hand … v M (Fides is a short squat figure). 54 Same type (standards held close to sides). 55 Same type (standard in r. hand off flan: Fides is very broad in the chest). C. Derivation from prototype uncertain. 56 I, 12 .7 31.9 (2.07) … AVDIVS … Features like those of Claudius II. 56 Female figure, draped, standing l., holding vertical trident (? broken at top) in r. hand and vertical sceptre (?) in l. C, low, left, in field. 58 Male figure, draped to knees, standing l., holding vertical spear in r. hand and vertical sceptre in l.
59 Female figure, draped, standing l., holding vertical object (sceptre or standard?) in either hand. M. & S., V ii, p. 407, No. 73; C. 44.—Tetricus I. in r. hand and cornucopiae in l. common in this group). M. & S., V i, p. 408, Nos. 79 ff; C. 53 ff. long palm and cornucopiae. A. Main type: no star. 67 .6 12.7 (.8) Curious loose drawing. 69 II, 2 .65 21.7 (1.41) … AV II OCT И … Features of Postumus. B. Main type: star (or other object) l., in field. 77 .7 27.2 (1.76) Draped. Youthful head. M. & S., V i, p. 396, Nos. 112 ff. ; C. 46 ff. 1. holding whip (sometimes, star l., in field). 65 Same type (Sol radiate). 69 Same type (radiate: mantle across chest). 73 Same type (r. hand off flan) … I II I Radiate. 75 Same type. Radiate … cta …. 76 Same type. Star (?) l.
C. Main type: P., l. infield. E. Main type, but turned to r.
84 .65 10.6 (.69) Draped …v. 78 Same type (on l., x low on r.). 80 Sol walking l., raising r. hand and holding whip upright in l.: p., l., in field. less closely from the 'Invictus' prototype. M. & S., V ii, p. 408, Nos. 86 ff. ; C. 70 ff. holding wreath and anchor. 87 Same type (very worn, but traces suggest this type). A. Main type: no drapery over l. arm. 96 .6 18.8 (1.22) … IIII. M. & S., V ii, p. 244, No. 239; C. 314.
and trophy. Reverse of Diocletian. M. & S., V ii, p. 409, Nos. 100 ff; C. 95 ff. 94 Same type (r. hand almost off flan). 95 Same type (r. hand almost off flan). B. Main type: drapery over l. arm. C. Probably as B., but not quite certain. 105* Same type. (r. hand off flan) …av. D. Probably as B, but altar l.
113 Same type. (Details of r. hand obscure) A…s . leg drawn back. the same reverse, of which one is illustrated. 116 As B., No. 1 (r. hand almost off flan) Altar l.
M. & S., V ii, p. 409, Nos. 100 ff. ; C. 95 ff. branch and transverse sceptre. M. & S., V ii, p. 475, No. 130; C. 222. 119 Pax standing l., holding up branch in r. hand and cornucopiae in l.: a fold of drapery falls over l. arm. pax avg. 120 Same type. … a xav. 123 .7 24.0 (1.55) … RICVS PI.V. Rev. pietas avgg (avgvsto etc.). 122 As No. 119 above (r. arm off flan: cornucopiae (?) in l. hand). 123 As No. 119 above (r. arm off flan: corn ucopiae (?) in l. hand), v. l. in field. probably show the same reverse. 128 Jug with lip l. (?) ιυλ Double struck. B. Jug and additional emblem r.
C. Jug and additional emblem l.
D. Jug and additional emblems r. or l.
135 Jug with lip r.: lituus on r.
136 Jug with lip l.: lituus (?) on r.
139 Jug with two handles (?) on two feet: uncertain emblem (?). 141 Jug with two handles: top is shaped like caduceus …; iicsiiii uncertain emblem, , with long stroke on l.
142 Jug with lip r.: lituus and knife on l., sprinkler on r… .ie … ΛS … 111 in ex. 144 Same type: sprinkler on l., lituus on r., + r. in field. 145 Jug with lip r.: uncertain emblem on l. and r.; in l. field, s.
146 Same type: lituus (?) on l., sprinkler on r.
147 Same type: sprinkler (?) on l. lituus (?) on r.
148 Same type: (stylized almost as a figure): sprinkler on l., uncertain emblem on r.
150 Jug with lip l.: sprinkler and simpulum on l., knife on r.
151 Same type: lituus on l., uncertain emblem on r. Border of large dots. 152 Same type: (on two feet): sprinkler on l., lituus on r…. c. r. in field. 154 Same type: lituus on l., and lituus on r.
155 Same type: uncertain emblem on l., lituus on r. … .cacc + l. in field. 157 Same type (with two feet): sprinkler on l., knife (?) on r.
158 Same type: sprinkler on l., lituus on r.
159 Same type (stylized): two objects, like litui attached to it by a bar on l. and r.
160 Jug with two lips: uncertain emblems on l. and r.; o above, vcqv on l.
161 Jug (or rather vase) with two handles: uncertain emblems on l. and r.
162 Jug with lip l. and r. (? ), on two feet: round object (patera standing on edge) on l., uncertain emblem on r.
Other worn coins show similar types: class A. 2. Rev. Pietas standing l., sacrificing at altar. 163 Three larger and one smaller jug. class B. 2, class C. 2, class D. 4. M. & S., V ii, p. 392, No. 58; C. 91. 167 Same type: (but cornucopiae for sceptre). Altar almost off flan. M. & S., V ii, p. 392, pp. 61 ff. ; C. 100 ff. wand over globe and cornucopiae. 169 Providentia standing l., holding in r. hand wand over globe and cornucopiae in l.
M. & S., V ii, p. 410, Nos. 121 ff. ; C. 148 ff. snake coiled round altar and holding sceptre. 171 Salus standing l., feeding out of patera in r. hand a snake coiled around altar, and holding vertical sceptre in l.
176 As on No. 171; r. arm and cornucopiae (?) off flan. 177 Same type. Detail of patera and altar obscure. 180 Woman standing l., r. hand extended over altar (? no snake), arm extended downwards. 184 IV, 6 .65 19.0 (1.23) … pivesv Features like those of Claudius II. 187 .7 17.8 (1.15) Draped …VIC. M. & S., V ii, p. 411, Nos. 130 ff. ; C. 158 ff. up flower and gathering up skirt. 183 Same type. ┫ on l.
196 As on No. 191. (flower off flan). Altar (?) r. in field. 197 Same type, but patera in r. hand, (lower part of figure off flan). M. & S., V ii, p. 360, No. 287; C. 31. M. & S., V ii, p. 407, Nos. 56 ff. ; C. 16 ff. 205 Same type. (Wreath clear) Star (?) l. in field. M. &. S., V ii, p. 167, Nos. 223 ff. ; C. 172 ff. M. & S., V ii, p. 411, Nos. 145 ff. ; C. 199 ff. spear and leaning on shield. 212 Virtus standing front, head l., resting r. hand on shield set on ground. On l., z reversed. 213 holding? in raised r. hand, arrow (?) in l.
(.78) end. Border of large dots. 214 holding branch in raised r. hand, l. hand lowered. Border of large dots. 215 holding branch in raised r. hand, l. hand lowered. 216 holding branch (?) in lowered l. hand, r. hand raised. 217 holding caduceus in l. hand. No legend (?). 218 holding vertical palm in r. hand, l. hand lowered, with fingers extended….2320 on r.; ladderlike object, IIIIII in ex. 219 holding long vertical caduceus (?) in r. hand, cornucopiae in l.
220 holding sceptre, nearly vertical in r. hand and long crook, nearly vertical, in l.
221 holding vertical sceptre in r. hand,? in l. In r. field, c.
223 holding vertical sceptre with knob at top (? ), in l. hand. 224 holding simpulum (?) downwards in l. hand, and? in r. hand. 229 both hands lowered. + + (?) l. and r. in field. 231 .55 15.5 (1.0) Bust, draped. 234 V, 9 .6 17.1 (l.11) Draped, cuirassed r.
239 V, 12 .6 20.5 (1.33) …C TET. 231 holding cornucopiae (?) in r. hand and rudder (?) on ground in l.
232 holding cornucopiae (?) in l. hand, r. arm extended. 233 holding cornucopiae (?) in l. hand, r. hand lowered. 235 both arms extended and lowered. No legend (?) short drapery). 236 holding up branch in l. hand, r. hand raised. Helmeted. Low on r…. om … outwardly. 237 holding long palm (?) in r. hand, l. hand lowered, l. arm extended and bent. 239 holding vertical sceptre (?) in r. hand, l. hand lowered, with fingers extended. Radiate. On l., cc (the first diagonally above the other). 242 holding vertical sceptre (?) in l. hand, r. arm extended downwards. 243 holding vertical spear in r. hand. Radiate. 244 with both arms extended, v on l.
255 .6 20.9 (1.35) Bust draped. Youthful head. 248 both arms lowered: radiate. Double-struck. 249 holding branch (?) in r. hand,? in l.
251 holding vertical sceptre in r. hand, l. hand at side. 252 holding vertical sceptre in both hands. No legend. 254 raising r. hand, and placing l. on side, l. elbow bent. 256 both arms extended and lowered: lower part of figure off flan. 257 holding branch in r. hand and vertical sceptre in l.: curious treatment of figure. 259 .6 22.8 (1.48) Draped. D. Standing r. 'male' figures (short drapery). 266† VI, 6 .5 14.6 (.95) Bust draped. 271 VI, 8 .65 33.9 (2.2) Head l. Traces of letters of unusual shape all around edge. 260 holding shield (?) in r. hand, l. arm raised, as if brandishing a javelin. D, l., in field. 261 brandishing javelin in r. hand, l. arm extended. 263 holding transverse spear upwards across body in both hands, - in loop of r. arm. 264 holding transverse spear upwards across body in both hands, x low in field l., large s (or snake) in field r.
269 Same type…. ⌟ …sis Helmeted (?) x, r. in field. 270 Same type (? spear not clearly seen). Helmeted. 276 VI, 9 .55 15.8 (1.02) IM. …. 272 holding horizontal sceptre across body in both hands. 263 holding vertical spear (?) in r. hand, round shield (?) on r. arm. 274 holding vertical spear (?) in l. hand, and sword (?) across body in r.
275 holding vertical spear (?) in l. hand, r. arm down. 278 holding wreath in r. hand and palm (?) in l. (curious curved lines). 282 Same die as No. 281. No legend visible. 284 with r. hand gathering up drapery, holding palm in l.
292* VI, 13 .6 20.8 (1.35) …. iiiiii …. E. Advancing r. 'Male' figures (short drapery). 296 VI, 15 .6 18.1 (1.17) Bust draped. Slightly double-struck. 298 .65 17.4 (1.13) ? Imitation of Postumus. 286 holding transverse sceptre, pointing up to l. in r. hand, and extending l. hand. 287 holding vertical sceptre in l. hand,? in r.
290 holding transverse spear (?) in r. hand, ↓ (?) in l.
291 raising r. hand, holding rudder (?) on ground in l.
293 raising r. hand, holding?, l. hand extended. 294 holding? over body in r. hand, l. hand bent over altar (?). 295 brandishing javelin in r. hand, l. arm extended. 296 holding vertical sceptre in l. hand, r. hand lowered holding? Slightly double-struck. No legend (?). 297 holding vertical sceptre and cornucopiae in l. hand, r. hand lowered, holding? 298 holding vertical sceptre in r. hand and? in l.
299 holding vertical spear in r. hand,? in l.
300 holding vertical spear in r. hand, l. hand off flan. Helmeted, wearing cloak to knees. 302 VII, 2 .55 19.2 (1.24) Bust draped. 304 VII, 3 .55 24.4 (1.58) Bust draped (? )xmn in front of head. 306 .55 24.5 (1.59) Youthful head. Bust draped. 309‡ .55 17.1 (1.61) Bust draped (?). 310 .65 14.5 (.94) Bust draped (?).? Overstruck on old reverse. 312 VII, 6 .5 15.3 (.99) Youthful head. No legend. 301 holding round shield in r. hand, vertical spear in l. Helmeted. No legend (?). 302 holding vertical spear in l. hand, r. arm on hip, r. elbow bent. ʃ (?) l. in field. No legend. 303 holding transverse spear upwards across body with both hands. 305 Same type. dvti … Helmeted. 306 holding wreath (?) up in r. hand and vertical spear (?) in r.
307* holding sword (?) in raised r. hand and axe (?) in l., right knee bent. 310 ? r. arm raised, as if brandishing javelin, l. arm thrust out. 312 both arms extended downwards, l. with fingers extended, knees bent. No legend. 313 r. arm out, elbow bent, r. hand downward. 314 r. hand extended downwards, l. arm raised. 315 head turned back l., holding vertical? caduceus (with two tops?) in r. hand and? in l.
F. Standing l. 'male' figures (short drapery). 322 VII, 10 .6 20.5 (1.33) \ in front of head. 317 holding? in raised r. hand, vertical spear in l.
318 holding out drapery in both hands: uncertain object half obliterated r. in field. 319 holding club on ground in r. hand,? in l. Border of large dots. 320 holding patera (?) in r. hand over altar and? in l.
321 holding vertical sceptre in r. hand, l. hand on hip. 322 holding vertical sceptre in l. hand, r. hand down, with fingers extended. Radiate. Angular. No legend. 324 holding vertical sceptre in l. hand and? in extended r.
325 holding vertical sceptre in l. hand and? in extended r.
327 holding vertical sceptre in l. hand, r. hand at side. ┌, low in field. 328 holding vertical sceptre in l. hand, raising r. hand above altar. 331 .7 24.9 (1.61) Bust draped. 333 .6 24.0 (1.55) No legend. 339 .5 17.2 (1.11) …. si …. 340 VII, 15 .8 29.2 (1.89) Bust draped. 330 holding vertical sceptre in l. hand. 331 resting r. hand on shield set on ground, l. hand lowered. 332 holding vertical spear in r. hand. 333 holding vertical spear in r. hand, l. arm extended, with fingers going out into circle of dots. No legend. 335 holding vertical spear (?) in l. hand, r. hand down. 337 holding? in r. hand, l. arm lowered. Helmeted. 338 holding? in r. hand, l. arm lowered. 341 r. arm lowered, l. arm raised, elbow bent. 342 r. arm at side, holding? (rudder) in lowered l.
343 extending r. hand to? on l.: uncertain object on r.
344 holding branch in r. hand and cornucopiae in l.
346 VIII, 2 .55 18.9 (1.22) Draped. … av divs p e avg. 348 .75 13.4 (.87) lllc …. A Youthful head. Bust draped. 359 .6 20.3 (1.32) ivpcltacitvsp … Bust draped. 346 holding branch in r. hand and cornucopiae in 1. …TVGG. 348 holding branch in r. hand and vertical sceptre in l. Uncertain object, low l., in field. 349 holding branch in r. hand, and anchor on ground in ;l. Uncertain object, low l., in field. 352 holding caduceus downwards in r. hand and vertical sceptre in l.
353 holding cornucopiae in l. hand, r. hand off flan. 357 holding cornucopiae in l. hand, r. hand lowered. 361 Same type. con, outwardly, on r. upwards. 362 .55 23.7 (1.54) Bust draped. 363 .6 16.5 (1.07) Bust draped. 370 .45 11.8 (.76) Bust draped. 371 VIII, 5 .6 32.9 (2.13) iiii … Bust draped. 373 .55 19.1 (1.24) . .ricvs . .
374 .55 20.1 (1.30) …c iiiic …. Bust draped. 376 .6 19.9 (1.29) Bust draped. 377 .6 25.4 (1.65) …ricvsa (?). 362 Same type, I, r. in field. 365 Same type, mivi … on r., upwards, outwardly. 366 Same type. r. hand raised, holding? 367 holding cornucopiae (?) in l. hand, patera (?) in lowered r. 2 on l.
371 holding corn-ears (?) downwards in r. hand over? (prow of ship? ), l. hand lowered over modius and corn-ears. 372 holding palm in l. hand, wreath (?) off flan in r.: winged (? Victory). 374 holding patera in extended r. hand, vertical sceptre in l. e (?) low l.
375 holding patera in extended r. hand, vertical sceptre in l. In l. field, X. 377 holding patera in extended r. hand,? in l.
379 .65 28.5 (1.85) …iri..
379 holding rudder on ground in l. hand,? (branch?) in r.
380 holding rudder on ground in r. hand, and cornucopiae in l. Drapery curling out. 385 holding vertical sceptre in r. hand, cornucopiae in l.
386 holding vertical sceptre in r. hand. 387 holding vertical sceptre in r. hand, cornucopiae in l.; low r., in field, x. 388 holding vertical sceptre in r. hand, o on l., s on r.
389 holding sceptre (nearly vertical) in r. hand,? (branch?) in l. vv on l.
390 holding vertical sceptre in r. hand. 392 holding vertical sceptre (?) in r. hand and? (cornucopiae) in l.
393 holding vertical sceptre against l. arm, r. arm extended, knee bent. ….A. 394 holding vertical sceptre in r. hand,? in extended l.
395 .5 9.2 (.6) Youthful head (?). Bust draped. pv … ricvscv. .
396 .6 12.9 (.84) ? Portrait like Postumus. 397 .6 10.8 (.7) icii … Youthful head (?) Bust draped. 398 .65 34.1 (2.21) i m p tet …. 408 .6 12.9 (.84) Double-struck? 395 holding vertical sceptre in l. hand. 399 holding vertical sceptre in l. hand,? in lowered and extended r.
400 holding vertical sceptre (or anchor?) in l. hand. 404 holding vertical sceptre (?) in l. hand. Note curious treatment of drapery. 405 holding vertical sceptre in l. hand (only top half of figure on flan). 406 holding? (shield on ground) in r. hand, and straight spear and round shield in l.? Helmeted. 408 holding vertical spear and round shield (?) in l. hand, transverse sword (?) across body in r.
409 holding vertical spear reversed in l. hand. 411 .65 13.3 (.86) Draped … vs.
412* VIII, 10 .6 19.8 (1.28) Traces of letters. 415 .6 24.3 (1.57) …avg. 421 .55 11.6 (.75) Draped (?) youthful portrait …cvs av. 410 holding vertical sceptre in r. hand, l. hand resting on?, r. on ground …s. v … c, l. in field. 412 holding vertical spear in r. hand, l. hand lowered, fingers extended. Helmeted. Traces of letters. 413 Same type. Traces of letters. 416 holding vertical sceptre in l. hand i … Border of spikes. 417 holding vertical sceptre in l. hand and? (patera?) in r. …v c.
418 holding vertical sceptre in l. hand (sceptre apparently double). 421 holding wreath (?) up in r. hand and vertical sceptre in l. x in field. 424 holding anchor on ground in l. hand,? (wreath?) in extended r.
425 ? holding anchor on ground in l. hand and? (wreath?) in extended r. … ʌʌ …. Double-struck. 426 holding anchor on ground in l. hand and wreath (?) in extended r.
427 holding anchor on ground in l. hand and wreath (?) in extended r.
428 holding anchor on ground in l. hand and? in r.
429 holding anchor on ground (or straight sceptre?) in l. hand. 431 holding up wreath in r. hand,? in lowered l.
432 holding anchor on ground in l. hand and? (wreath?) in extended r.
433 holding wreath (?) in extended r. hand,? in l.
435 holding wreath (?) in raised r. hand, and palm in l.
436 holding °|° (?) in r. hand and? in l. Radiate. ᴗ high on r.
437 holding C in r. hand and ϧ in l.
453 IX, 1 .6 11.1 (.72) … LL (?) VS (?) A… Features of Quintillus. 454 .55 21.6 (1.4) Bust draped …savg. 439 holding? transversely (upwards to l.) across body in r. hand, l. arm extended, fingers spread. …i i i. 440 holding? in raised r. hand,? (cornucopiae?) in l.: (only part of figure showing) … c s i. 441 holding? in r. hand and? (long caduceus?) in l. (only lower part of figure showing). 442 holding? in r. hand, ;l. hand down with fingers extended, ixiiv…ivii. 444 holding? in r. hand and?, spear nearly vertical, in l.
447 holding? (wreath) downwards in r. hand. 450 holding up? (wreath) in r. hand, and ᴗ in l.
452 holding? (torch?) across body in both hands. 457 .5 23.6 (1.53) Bust draped. 459 .65 24.3 (1.57) imp … Star (?) behind head. 462 .65 13.0 (.84) Draped diademed (?) l. Traces of good lettering. 467 .55 22.1 (1.43) Doublestruck. 455 holding? in extended r. hand,? (anchor) in l. hand. 457 raising r. hand, holding? (≀ -bow) in l.
459 holding? (patera?) in lowered l. hand and cornucopiae in r.
460 r. hand lowered, holding cornucopiae (?) in l.
461 holding? in extended r. hand, e (?) l. in field. 462 Juno standing l., holding patera in r. hand, and vertical sceptre in l.: peacock l.
465 holding? in extended r. hand. ẋ in l., on r. in field. 466 holding spear (?) across body in both hands. 470 both arms extended, holding? in r. hand. 471 Female figure (draped) holding? (wreath with bands) in r. hand,? on shoulder in l.
472 holding up flower (?) in r. hand and gathering up skirt with l.; in r. field, . 477 Horse with pole, as if harnessed to chariot (? ), r.
484 Stag l. (?) … co vv vi . .
488 Tetrastyle temple with pediment. Traces of legend. 480 Distyle temple. Altar (?) and standing figure (?) in front. 495 X, 5 .55 31.2 (2.02) Bust draped. No legend. 500 .5 16.6 (1.08) Border of large dots. 493 Altar (?) In the place of legend, ]]]] on all sides. 494 Uncertain object (Hand l.?) IIIIIIII round edge. 495 Cross with a pellet in each angle. No legend. 496 Cross (Latin) in wreath. 497 Cross (Latin), partly in circle. 498 Figure like cross (Greek), with additional lines attached to limb, (? a broken-up figure, stylized). 499 Figure standing l., in process of being stylized as a cross-like pattern …t(?). .v. .
502 p. 109, fig. 3 (Peculiar) Spidery design. 503 p. 109, fig. 4 (Peculiar) Part of standing figure and border (?). 508* X, 11 .55 25.4 (1.68) Draped. Youthful portrait … cvs. 512 .45 15.4 (1.0) Draped … isnc. 508 p. 109, fig. A Peculiar A. Same rev. die as 509. 509 p. 109, fig. A Peculiar A. Same rev. die as 508. 510 p. 109, fig. B Peculiar B. Stylized figure standing l. holding up branch. Border of strokes. 511 p. 109, fig. C Peculiar C. Remains of Fides standing l., holding standards. 512 p. 109, fig. D Peculiar D. Remains of stylized figure holding branch (?);? E l. in field. 514 p. 109, fig. 10 (Peculiar) Pattern-like treatment of body of standing figure. 521 .75 22.1 (1.43) Longhead cd … d(?) vs high in field r., i. Double-struck. 523 .65 20.0 (1.27) …cii (?) csnv. 525 .55 7.8 (.51) Small head, with curious angular features. Two pellets below bust. but no reverses that can be accurately described. 521 Female figure standing l.: altar l. (?) Doublestruck. 528 Warrior standing l., driving down spear at some object at his feet l. Broken border of large dots. 2. (a) Warrior dragging captive l.
530 Warrior standing l., with r. hand driving down spear at prostrate figure (captive or animal) at feet l., and holding branch downwards in l. hand. 531 As on No. 530, but no trace of prostrate figure, though it might be off the flan, C on r.
perhaps show similar reverse types. 535 Warrior advancing r., with r. hand dragging small figure and holding vertical spear in l.
536 As on No. 535, but badly worn. (b) Warrior dragging captive l.
540 Warrior advancing r., with r. hand dragging small figure, r. hand raised. *, r. in field. 542 Warrior advancing l., r. hand raised, holding? (off flan) and dragging animal (?) with l. hand. 543 Warrior advancing l., r. foot raised, r. knee bent, holding vertical spear in r. hand and dragging captive (?) with l.
544 Warrior advancing l., r. hand extended, holding? (off flan) and dragging captive (?) in l. Large star (?) r., in field. 547 Large figure standing r., r. hand lowered, l. hand raised; on l., animal (? ); on r., smaller figure standing r., holding? in raised r. hand…. dc. Double-struck. 549 Warrior advancing r., r. hand lowered, holding? (arrow) in l.; at his feet r. helmeted figure sprawling on ground (?). 550 Warrior standing r., holding vertical sword (?) in r. hand; to r., smaller figure kneeling (?). 552 Man advancing r., driving smaller figure, with arms outstretched, before him. 553 Warrior advancing r., holding? in lowered r. hand and bow (?) in l.; to r., smaller figure kneeling r. Traces of worn letters. 554 Man standing front, head r., with r. hand thrusting down figure sprawling on ground l., l. arm lowered. Uncouth linear figure, with long arms like an ape. 555 Warrior standing l., raising r. hand and holding vertical standard with vexillum (or labarum?) in l.: to l., captive kneeling on ground (?) v. ͽ under standard. 556 Warrior standing l. (?) holding small figure (?) off ground in r. hand and vertical spear in l. Traces of uncertain letters. 558 Two small figures, both with arms raised above heads, standing front, side by side … im … Star r., in field. 563 Man standing front, on r., holding vertical spear in r. hand. Doubtful traces of what was perhaps a second figure on l.
Same obv. and rev. dies. Some of these types will recall known models, but they are placed here because the resemblance is imperfect or uncertain. Same obv. (?) and rev. die as No. 266. Same obv. (?) and rev. die as No. 265. Same obv. and rev. die as Nos. 282 and 292. Same obv. and rev. dies as No. 281 and 292. Same obv. and rev. die as Nos. 281 and 282. Same obv. and rev. die as No. 308. Same rev. die as No. 309. Same obv. and rev. die as No. 307. Same rev. die as No. 309. Same rev. die as Nos. 307, 308. Same obv. and rev. dies as No. 412. Same obv. and rev. dies as No. 407. Same obv. die as Nos. 414 and 414A. Same rev. die as No. 414A. Same obv. die as Nos. 413 and 414A. Same obv. die as Nos. 413 and 414. Same rev. die as No. 413. Same obv. (?) and rev. dies as Nos. 508 and 509. Same obv. and rev. dies as No. 479. Same obv. and rev. dies as No. 478. Same obv. (?) and rev. dies as No. 477. Same obv. die (?) as No. 509. Same obv. and rev. die as No. 477. Same obv. die (?) as No. 508. Same rev. die (?) as No. 538. Same rev. die (?) as No. 537. Plates XII(end)-XIV(beginning) illustrate a number of barbarous radiates in the British Museum, which, at one point or another, seem to touch the Richborough hoard. The provenance of Pl. XIII, 3—the only one for which we have information— was Richborough. It seems unnecessary to add full descriptions where all are illustrated. The obverse of Pl. XII, 15, has part of the name of Victorinus; the obverses of Pl. XIII, 2, 5, and XIV, 4, make some kind of an attempt at the name of Tetricus I. Many of the reverses cannot be referred to any known original. But Pl. XIII, 1, shows a Pax type, Pl. XIII, 2, a Pietas, Pl. XIII, 3 and 4, Priestly Emblems (pietas avgg. type), Pl. XIII, 5, a Spes, Pl. XIV, 2, a cross, Pl. XIV, 4, a temple. Pl. XIII, 9, and XIV, 7, are of peculiar interest. Pl. XIII, 9, shows a radiate head l., with an obscure reverse, traces of barbarous lettering on both sides, overstruck on a gloria exercitus, two soldiers, type of the late Constantinian period, c. A. D. 330-340. Pl. XIV, 7, shows a crude head, r., apparently radiate, with rev. Warrior on horseback r., brandishing spear, overstruck on what was probably, but not quite certainly, a coin of about the same date as the original of Pl. XIII, 9. A comparison of these Plates with Plates I to XII will reveal noteworthy similarities of style in a number of points. The time is nearly ripe for a full discussion of this fascinating, but enigmatic coinage. In their analysis of the Richborough radiate hoard, Messrs. Mattingly and Stebbing have pointed out that there occur in it types which do not go back to any Roman prototype. 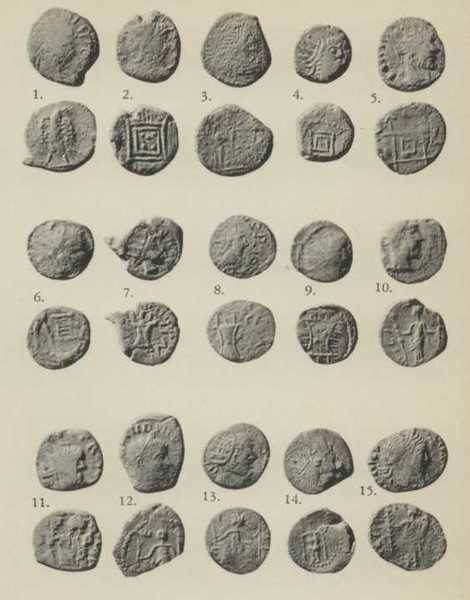 They have suggested that these coins may be the earliest attempts at original design by the Jutes who accompanied Hengist and Horsa. The evidence which Mr. Mattingly has brought forward from the side of Roman coins is strikingly confirmed on the side of Anglo-Saxon. 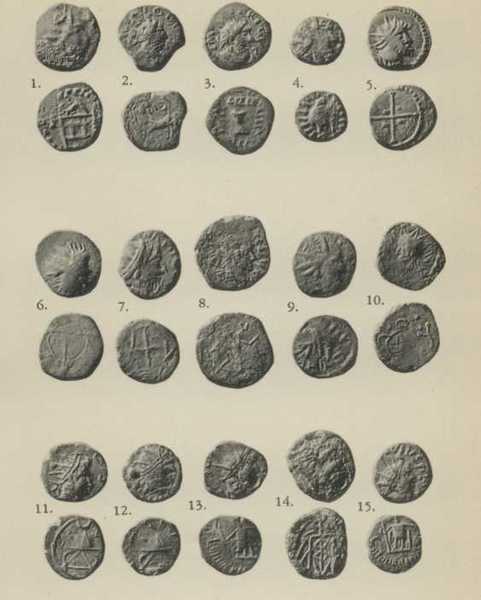 If the date proposed is correct, it would be reasonable to expect some relationship between the types of the Richborough coins and of the earliest of the Anglo-Saxon thrymsas and sceattas. Although a general date for the whole series from 600 to 750 A. D. 15 is well established, it is unfortunate that the fifty or sixty known types have never been arranged chronologically within these limits; it is as yet impossible to say precisely which of them are the earliest. An appendix such as this is not the place to indulge in new and speculative classifications. It may, however, fairly be said that the majority of thrymsa and sceatta types use decorative motives which occur on other Anglo-Saxon objects. 16 There are, nevertheless, a few types whose designs cannot be found elsewhere in contemporary art; most of these designs are derived directly or mediately from Roman coin types. 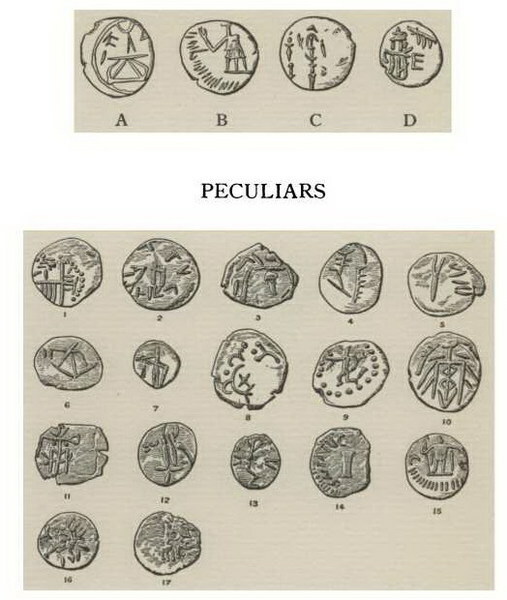 Those which are directly derived do not concern us here; but there exist sceattas which, though they obviously stand in some relation to Roman coins, are so far from the original as to imply a lost intermediate stage. It is more than a fortunate coincidence that the Richborough hoard provides us with some of these intermediate stages. Against this view it might be urged that the heads on the majority of sceattas are derived from Constantinianor Theodosian models. I do not think that the objection is valid because in the sixth and seventh centuries the only silver coins with which the inhabitants of England are likely to have been familiar, are siliquae. 17 When striking a silver coinage, they may well have preferred diademed heads, while for copper coins they copied the commoner radiate models. A few thrymsas and sceattas actually have radiate heads, and on the earlier specimens of this class, (Pl. 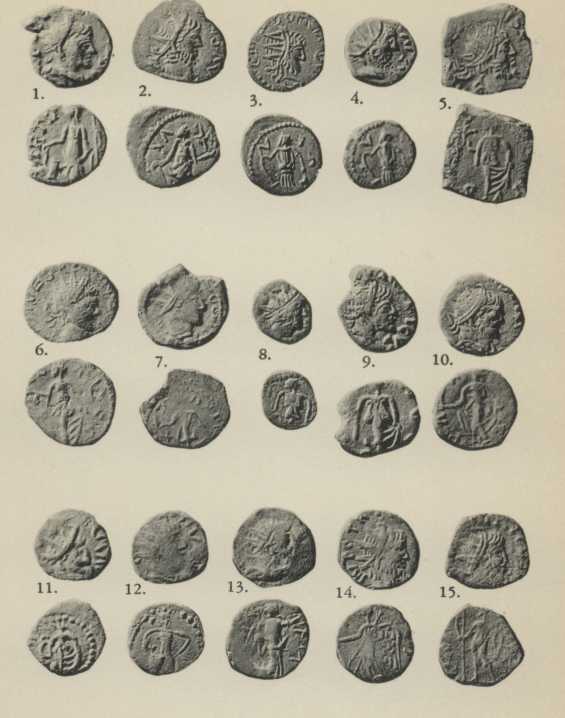 XV, 8 and 9), the head is represented in a manner extraordinarily similar to that on one coin in this hoard, Pl. V, 10. In preparing their lists Messrs. Mattingly and Stebbing have wisely refrained from recording the fabric of the coins, since no verbal description is ever adequate. There are, however, considerable differences in fabric in the hoard, differences so marked as to be visible even in the plates. It was most noticeable in handling the coins that those which were most closely related to the sceattas in design were of a distinctive fabric. The coins were rounder, flatter and perhaps thicker than the majority of the hoard. Their designs were indicated more by line drawing than by relief. In almost every case a beaded circle had replaced the traces of the legends on obverse and reverse, a feature which recurs on sceattas. These circles were often considerably narrower than the diameter of the coin, and became an important part of the design. See for example, Pl. VI, 10; VII, 6, 10; X, 5. On Plates XIV-XV are twenty examples of gold and silver Anglo-Saxon and Merovingian coins, chosen for the relationship they bear to the Richborough coins. The first series, Pl. XIV, 8-12, have been chosen to illustrate the use of radiate heads on thrymsas and sceattas. The obverse of Pl. XIV, 8, a thrymsa, 18 is remarkably similar to Pl. V, 10, though one is beardless and the other bearded. This type of head occurs also on sceattas such as Pl. XIV, 9; the earliest bear the meaningless legend tic, though this is later replaced by Runic legends, as on Pl. XIV, 10 and 11. 19 Pl. XIV, 12 is possibly a Merovingian coin; it is included to show how confused the derivation of the obverse had become in the sixth century. The obverse of this coin clearly belongs to the same class as the others in the row. It even has the same legend as Pl. XIV, 9. There is, however, no trace of the radiate crown. The sceatta, Pl. XV, 1 represents on the obverse a female centaur holding two palm branches. This curious subject is derived probably from the leg ii parth coins of Carausius, and is without parallel in Anglo-Saxon art. The type has, however, diverged somewhat widely from the original, and the presence of the palm branches may have been suggested by the horns of a stag on a coin such as Pl. IX, 13, itself derived from one of the legionary coins of Gallienus. It would then be an instance of the conflation of two earlier types, a process which often occurs on sceattas. Pl. XV, 2, is an example of the well-known wolf and twins sceatta. The obverse is clearly copied directly from a Roman original. The reverse, however, which depicts a bird in an upright position between two vines, has no Roman prototype. The arrangement of the design is similar to that of the standing figures in the rest of the row. A bird pecking at grapes is a well-known Christian emblem and occurs somewhat later on the Ruthwell Cross. The general design, however, appears to be taken from a coin such as Pl. III, 11 where the sacrificial jug has assumed a form almost identical with this bird. A similar treatment of the human body occurs on Pl. XV, 4. The next five sceattas, Pl. XV, 3-7, illustrate varieties of standing figures, some of which have remarkable analogies with the Richborough coins. Compare, for instance, Pl. VI, 10 with Pl. XV, 6 for the curled arms; Pl. VII, 6 and 7 with Pl. XV, 5 and 6 for the body and dress; Pl. VII, 10 with Pl. XV, 7 and 8 for the breasts; Pl. I, 14 with Pl. XV, 3; Pl. VII, 12, with Pl. XV, 5; Pl. X, 15 with Pl. XV, 4 for the exergual line, with Pl. XV, 6 for the arms. Pl. XV, 8 shows a two figure type such as Pl. XII, 15. Pl. XV, 9, is a thrymsa and is presumably amongst the earliest coins of the series. Though very different in style from the other representations of the human body in this plate, it too has analogies in the Richborough hoard. Compare for instance Pl. V, 10 or Pl. IX, l.
Pl. XV, 10 was included to illustrate from sceattas the tendency to revolving designs which is shown on some of the Richborough coins such as Pl. 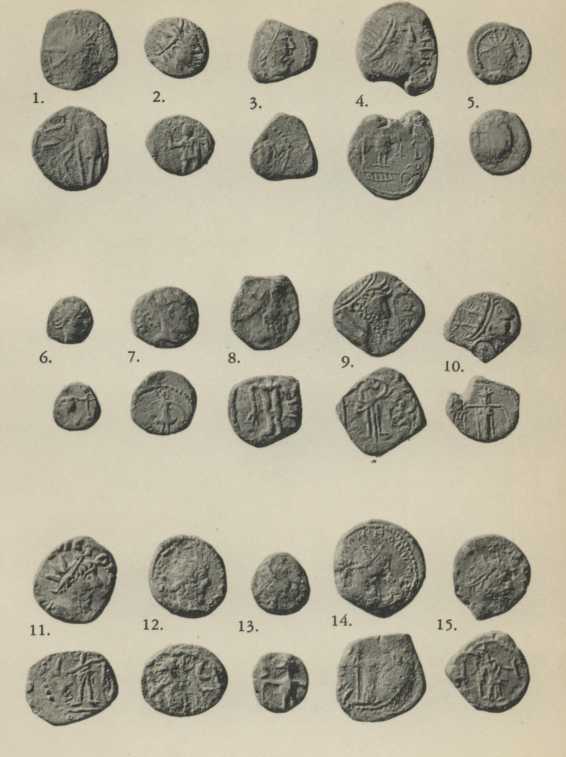 V, l.
The Richborough coins provide an important link in the derivation of the "altar" or "standard" type of sceatta reverse, illustrated in Pl. XIV, 9, 10, 11, and XV, 8. It has always been known from the inscription totxx or totii, which appears on the less barbarous varieties, that the type was derived from either the altar or the standard of various Roman coins. On sceattas, however, the type is both stereotyped and far from the original. The Richborough coins show how this may have come about; Pl. I, 2-5 illustrate various misunderstandings of the altar. Pl. I, 2 even shows five pellets arranged precisely as are the letters in Pl. XIV, 9. It must be admitted, then, that some relationship exists between the designs of the Richborough coins and the sceattas. So marked is this that it would not, to my mind, be adequate to say that the two series were struck at widely different points in the same artistic period. 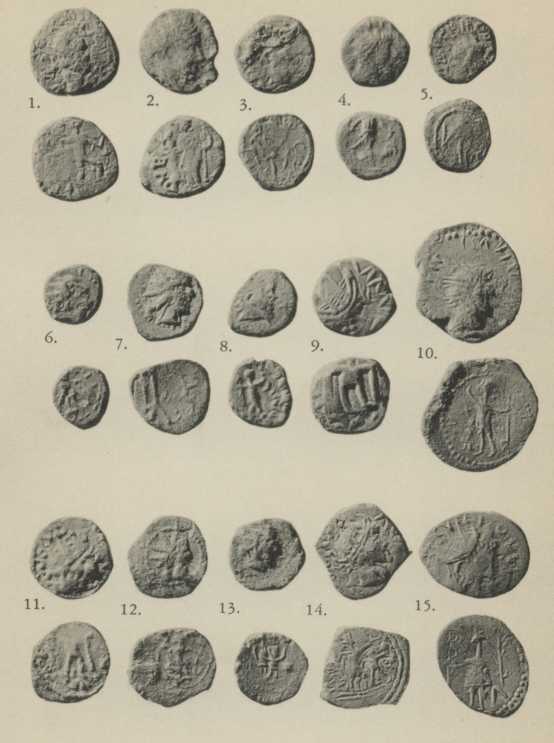 The artists of the thrymsas and sceattas must, I think, have seen and handled coins similar to those in this hoard. If this is so, it has somewhat drastic consequences on the dating of the hoard. 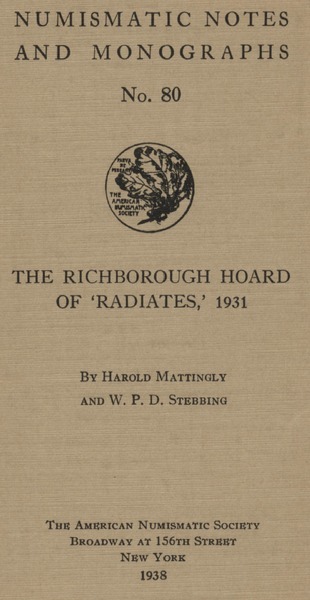 The hoard which is the subject of this monograph is not the only barbarous hoard from Richborough. There has also been found in the uppermost layer a hoard of 'minimissimr derived from Constantinian and Theodosian types. 22 These coins are of extraordinarily small size, and some of them are of metal so debased as to be barely distinguishable from lead. Fragments cut from earlier coins were found with them. There can be no doubt that these coins represent the last stage in the direct tradition of Roman coinage. They must have been struck at a time when metal was of almost fabulous scarcity. By the time the radiate hoard was buried, conditions had completely altered. Copper was no longer scarce and the continuous tradition of Roman coinage had now been broken. Moneyers copied not the last coins in circulation, but any chance coins they found. There must therefore have been some gap in time between the burial of the two hoards. Given such a gap, the degree of fidelity to Roman models provides no indication of its length. The only internal evidence of date which the hoard presents, is the relationship which some coins in it bear to sceattas. It would be impossible to date any Anglo-Saxon thrymsas or sceattas much before 600 at the earliest. There is no intrinsic reason why the coins in this hoard should have been struck nearer 500 A. D. than 600 A. D. It has often been supposed that the peoples of England in the fifth and sixth centuries used Roman copper coins which they had dug up or imitated. 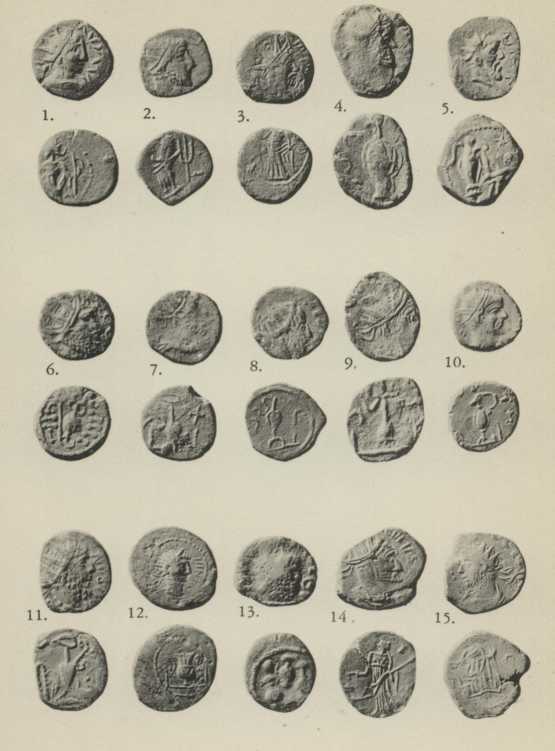 23 The analogies between the Richborough coins and the sceattas suggest very strongly that this hoard provides a sample of the coins in question. Messrs. Mattingly and Stebbing have suggested that the hoard represents the money which Hengist and Horsa brought with them. I prefer the bolder hypothesis that the latest of these coins belong to the age of Augustin. Brooke, " English Coins." p. 5. Baldwin Brown, "The Arts in Early England," pp. 56-113. In the British Museum collection there are no barbarous copies of radiate coins in silver, whereas Constantinian silver was frequently copied. The reverse type of this coin, the clasped hands, also occurs on barbarous radiates from Richborough, though none occurred in this hoard. The obverse of Pl. XIV, 11 has been mounted on the plate at the wrong angle. The reverse of this coin has been mounted on the plate at the wrong angle. The majority of thrymsas in the Crondall Hoard, buried not long after 610 A. D., have crosses on the reverse. Unpublished; kindly shown me by Mr. Stebbing, the finder. Brooke, "English Coins," p. 2:—"In the fifteenth and sixteenth centuries Roman copper coins, whether surviving as currency or dug up as treasure from the earth, doubtless circulated with barbarous imitations to serve the monetary requirements of the invading and invaded peoples." Pl. XIV, 8. AV. Thrymsa; Num. Chron. 1922, p. 215, no. 2. 9. AR. Sceatta; B. M. C. no. 12. 10. AR. Sceatta; B. M. C. no. 37. 11. AR. Sceatta; B. M. C. no. 49. 12. AR. Merovingian Silver coin; uncertain mint. Pl. XV, l. AR. Sceatta; B. M. C. no. 189. 2. AR. Sceatta; B. M. C. no. 77. 3. AR. Sceatta; B. M. C. no. 88. 4. AR. Sceatta; B. M. C. no. 97. 5. AR. Sceatta; B. M. C. type 16, var. 6. AR. Sceatta; B. M. C. no. 105. 7. AR. Sceatta; B. M. C. no. 113. 8. AR. Sceatta; B. M. C. type 51. 9. AV. Thrymsa; Num. Chron. 1922, p. 215, no. 3. 10. AR. Sceatta; B. M. C. type 37. 11. AV. Merovingian Triens; Pfalzel. 12. AV. Merovingian Triens; Compreignac. 13. AR. Sceatta; B. M. C. no. 135. 14. AV. Thrymsa found at Warminster, Wilts. 15. AV. Thrymsa; B. M. C. no. 7. All these coins are in the British Museum. 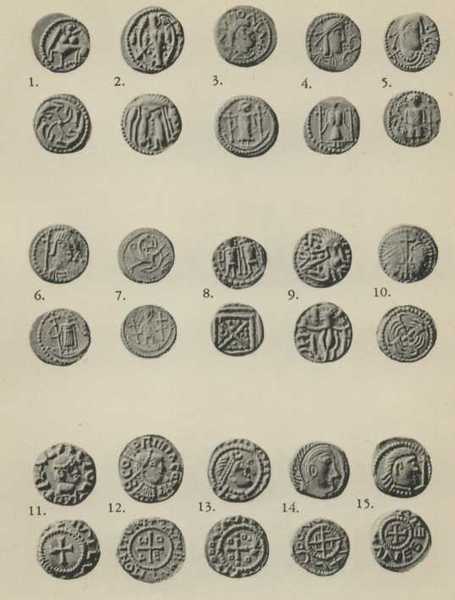 The references are to the British Museum Catalogue of Anglo-Saxon Coins. Vol. I. pp. 1-22.